Richard fishes the shallow, sandy lagoon at the end of his street from his kayak. 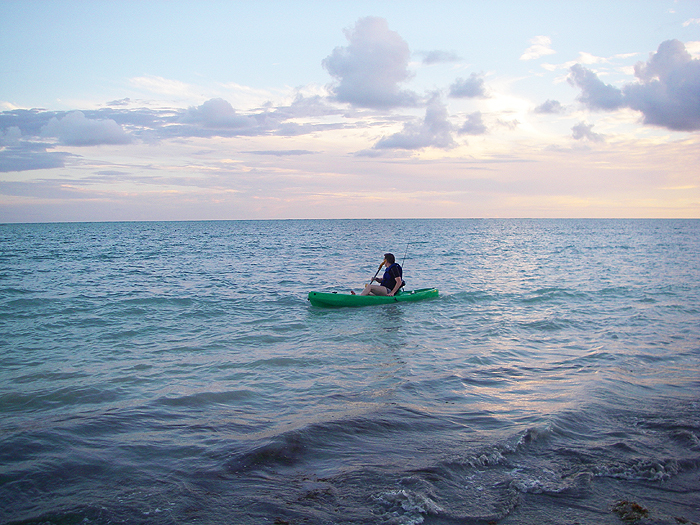 Usually he paddles out to the reef (perhaps 400m) and either trolls or spins. 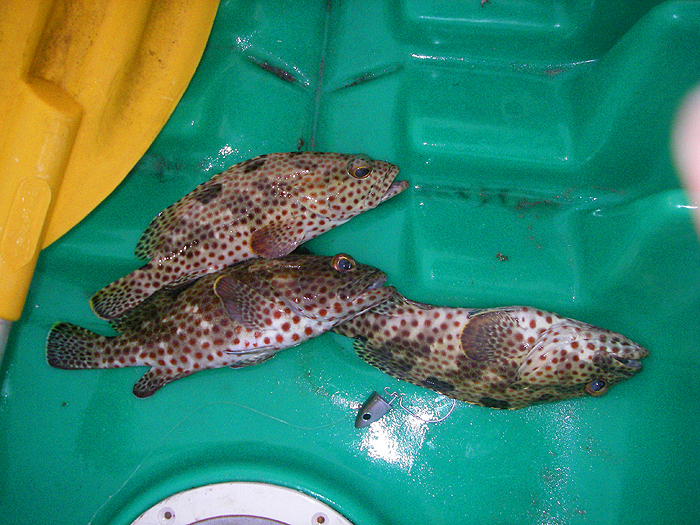 On the whole he has used smallish lures (9cm Rapala and the like) and caught a variety of fish, some of which are appreciated as a meal by his Brazilian friends. On my recent visit in January one or two events (see the two previous web pages) convinced him that it might be worth trying for bigger fish. Anyway, here are his recent emails which seem to be showing things in a new light. 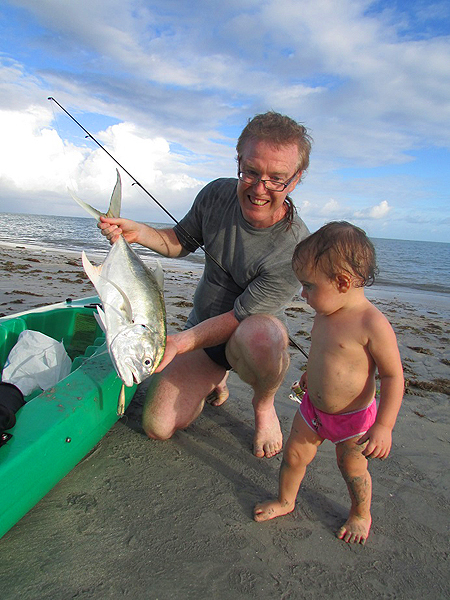 The first trip was to the beach where we had the big snook during my holiday (see the two previous web pages). Another interesting session at Praia da Sereia, though no fish this time. The conditions were calm with a bit of a swell after the storms of yesterday. I fished in the normal spot for 15 min with a Slandra with no bites, then went to the rocks closer to the river. No bites. Changed to a Black Minnow and worked my way back to the hotspot. When I got back I could see some baitfish at the edge of the weeds and occasionally something would have a desultory go at them. 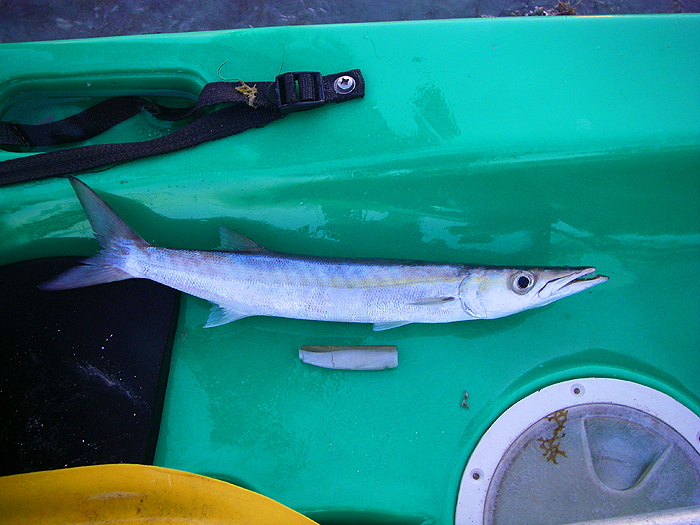 Sure enough, after 5 mins something hit the Black Minnow but didn`t stick - the hook had been almost completely knocked out of the minnow but there were no obvious barracuda marks.... interesting. Changed to a Sluggill, but no further bites. So, another session, another bite from a decent fish. It`s impressive how often that spot produces. Low tide is at 04:50 am tomorrow... will probably give it another crack. We have meetings all day in Maceio so, unfortunately, no reef fishing unless we get back early. Hope your weather gets better soon so you can get out and do some fishing. Really missed you on the rocks this morning - it was a glorious sunrise and a pleasure to be out, despite no fish. Hope the rain isn't getting you down! Ho ho ho!!!! We got back from our meetings at about 02:30 today and by 03:30 I could see the wind had dropped to almost nothing so I closed my computer, grabbed my rod, and told Ana I was off for another 40-50 minutes 'exercise' in the kayak. After seeing the big 'jack attack' yesterday(He'd seen a fish, presumed to be a jack, attack a decent mullet out by the reef) I decided to follow your advice and stuck on a medium sized popper having first changed the hooks for something a little heavier. However, I kept the 20lb Nanofil and my customary 25lb nylon trace. Conditions were much like the previous day (but without the oncoming storm). However, after 30 minutes flogging it was clear nothing was interested in the popper. I thought I would give it 10 more minutes with a Black Minnow in the hope of a 'cuda. Once again, no bites, but just as I was heading back in something big hit some bait fish where the waves were foaming onto some shallow reef, about 50 m to my right. I watched for another couple of minutes, not being totally sure of what I had seen. Once again there was an enormous frenzy and a 20-30lb crevalle came full out the water like a torpedo! Cursing quietly to myself, I tied a popper back on with trembling hands. First cast to the side of the reef, nothing. Second cast dropped short, nothing again. I paddled closer until I was about 20 m away from where I saw the fish and put the popper into the foaming water... I stared in disbelief as something big launched itself after the popper, tracking through the surf with its back and scimitar shaped tail thrashing out of the water! 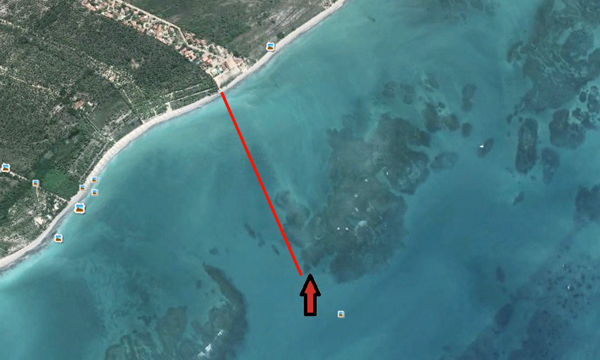 It absolutely hammered the lure just the other side of the reef and immediately dived, taking 20-30 metres of line. What then followed was an exhausting war of attrition where I would gain a few metres only for the fish to take them again, rod tip plunging into the water and me nervously watching the tiny rod bend almost double. It clearly wasn't the monster I had first seen (thank f**K, or I would still be there now! ), but was a good fish for sure. After 20 minutes both the fish and I were exhausted. 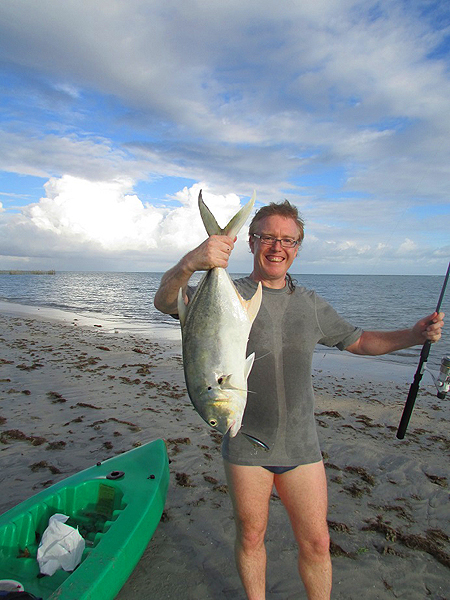 A fantastic gold-silver crevalle jack appeared through the blue-green water and I gratefully slid it headfirst into the kayak by the nylon trace. A beautiful fish of about 12lbs and my first big jack from Brazil. It also taught me an important lesson - if I am going to get one of the big ones (30-50lb) out I will need to think again about my tackle. Lets talk soon.